In 1833, in the north woods of Ohio, Oberlin Collegiate Institute opened its doors not just to men, but to women, as well. Founded by a Presbyterian minister and a missionary, Oberlin’s goal to train Christian leaders for the Western frontier was equalitarian across both economic and gender lines. Students labored in exchange for learning, opening the horizons of higher education beyond the limits of the upper class. 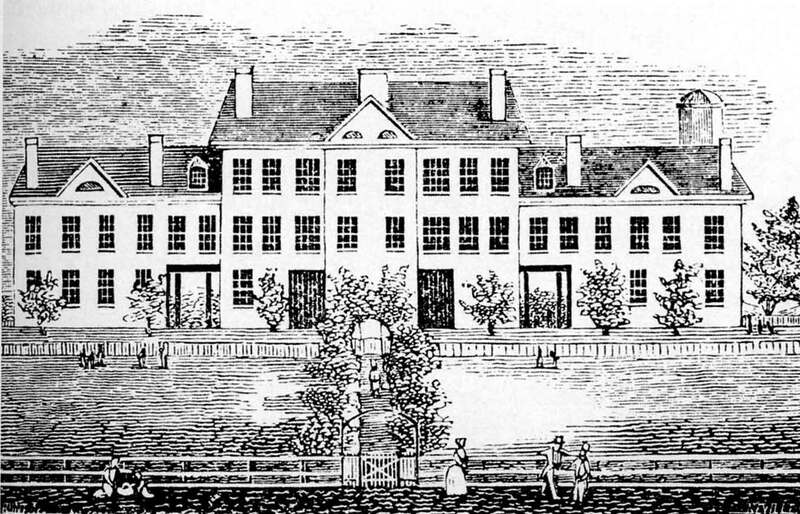 Following this isolated and rather shocking co-educational experiment, the Virginia General Assembly officially incorporated the Buckingham Female Collegiate Institute on January 13, 1837, making it the acknowledged first chartered college for women in Virginia, perhaps in the nation. Between $27,000 – $36,000 has been estimated for the cost of the school’s construction, and it showed. Sitting on 120 acres of level meadow, the main, three-story building contained fifty-two rooms, including classrooms, music rooms, and an auditorium or chapel. The interiors were top quality, the main Hall paneled in walnut with carved cornices. Most, but not all, of the students boarded at school, and their rooms were appointed with walnut bedsteads and washstands. This was Buckingham County at the top of its game. Cutting edge. Bold. Groundbreaking. These planters wanted their daughters educated . . . and in style. In the coming months, we’ll continue to look at the men who conceived The Institute, the enriching impact it had on Buckingham’s culture, and the lives of some of the women who attended it. Bill has a good point. (See below in this crazy stack of comments.) DNA is rewriting history (family history, at least). The Browns have long been a Buckingham/Albemarle puzzle. I’m glad to learn that there is an active Brown DNA project! My great-great-grandfather, John Chapman Blackwell was the last President of the B.F. C. I. I have an 1860 catalog, which may be the last one printed. I am also connected, one way or another (mostly by descent) with the Ayres, Garland, Brown, Hanes, Bransford, Davidson, Agee, Eldridge, and Ford families of Buckingham County. A number of years ago, I published a book on these families called Taproots – A Virginia Carolina Legacy. There are copies in the Virginia State Library and the Historical Society collection at Buckingham Courthouse. I show that Martha Robertson Bransford married John B. Agee 5 September 1807 (“Vital Statistics Found in Guthrie’s Grammar,” The Register of the Kentucky State Historical Society, Vol. 30, p.100), presumably in Buckingham County. Sue Roberson West of Gravel Hill, Virginia wrote a history entitled “Buckingham Female Collegiate Institute” (Charlotte, N. C.: Delmar Printing, 1990) before she died 12 October 1992. She married John Francis West. She lived at the old “Tavern House” in Gravel Hill just across the road from the Institute site. She and her husband are buried at Brown’s Chapel Church, the old church of the Institute. Her husband was a distant cousin, and I was a guest in her home several times. We collaborated on our historical and genealogical interests for a number of years. I have wondered if her book is still somehow available. When she died, I was advised by the trust officer at the Richmond bank handling her estate, but I neglected to inquire about any remaining inventory of her books. I seem to remember her saying she had sold them all. It was a very limited publication, but a very fine book. It reproduced a watercolor of the main bldg. at the B. F. C. I. on a piece of sheet music by Andre Preot, a music instructor there. I am not aware of a photograph, but I have photos of the President’s House, now demolished, and my family archives helped produce the data necessary to date the house and get it on the Virginia Register of Historic Places. I am writing this on vacation and had my book with me to enter this annotation, I do not have a photographic memory, so that may not be the exact name of the Register; however, there were other published accounts of the B. F. C. I.: Loulie Patteson, “Buckingham Female Collegiate Institute,” The Farmville Herald, Farmville, Virginia, January 13, 1933; Loulie Patteson, “Buckingham Female Institute,” Richmond Christian Advocate, Richmond, Virginia: Virginia Conference of the Methodist Episcopal Church South, 1933, Vol. LXI, No. 13, March 30, 1933, pp.1-4; William M. Rachel, Virginia’s First College for Women – The Female Collegiate Institute in Buckingham County,” Virginia Cavalcade, Richmond, Virginia: The State Library Board, 1952, Summer 1952, pp. 44-47. This last one, I believe, is the publication that reproduced the copy of the Preot sheet music rendering of the building. I will try to remember when I get home to post the information on the historic register of the President’s House for any who might be interested. I would welcome an exchange of information with anyone connected to the families in Buckingham mentioned above, or to the Institute. I am an attorney in Nashville, TN. I am familiar with Taproots and am delighted to take this opportunity to thank you for your important work about Buckingham County families and for this helpful bibliography for Buckingham Female Collegiate Institute. The chapter I wrote in “At a Place Called Buckingham” concerning the Institute relied on some of these sources. Sue West’s work does include many wonderful photos, as you mentioned, and your ancestor, Dr. John C. Blackwell, was indeed an important and respected figure in Buckingham County. Interestingly, my ancestor, John T.L. Woodson, contributed to one of Dr. Blackwell’s obituaries. Does anyone know if there are school records from Buckingham Female Collegiate Institute? My 3rd great grandmother Mary Win(g)field Jones obit says that she went there in the 1830’s. She would marry Rev. John R. Bennett in 1839. Thanks for joining us at Slate River Ramblings. Paul, here is a little material I have on some of my ancestors who resided in Buckingham Co.
On January 28, 1837 the Richmond Enquirer ran an announcement that read, FEMALE COLLEGAITE INSTITUTE, Buckingham – By an act of the General Assembly of Virginia passed January 12th, 1837. William A. Smith, Samuel Jones, John Early, James Garland, Lewis Skidmore, Theoderick C. Gannaway, Harold B. Scott, Edward F. Redd, Richard G. Morriss, John A. Scott, Wm. Woodson, Beverly A. Brown (Col. Beverly A. Brown), John Thompson, Leroy M. Lee, Wm. J. Waller, Alexander Rives, Archibald A. Campbell, Asa B. Brown (Asa Brightberry Brown), Jacob Agee, Jr. and Henry Branch, are constituted a body politic and corporate, by the name and style of the trustees of the Female Collegiate Institute. This act authorizes the undersigned to “appoint” the first meeting of the board. We accordingly announce to the trustees of the Female Collegiate Institute, that the first meeting of the board will commence at the Institute, on Wednesday, the 1st day of next month, at 10 o’clock, A. M. and continue in session until the business is completed, and we would particularly remark, that eight members of the board will unavoidably be absent from the first meeting, and that unless the residue are strictly punctual, no business can be transacted; for the charter requires a majority of the members to form a quorum. Col. Beverly A. Brown mentioned above was the son of Benajah and Mary Frances (JARMAN) Brown, he was the brother of Garland Brown, he married Sarah Brown the daughter of Bernard and Elizabeth (DABNEY) Brown) and grandson of Benjamin and Sarah (THOMPSON) Brown. Asa B. Brown mentioned above was the son of Bernard and Elizabeth (DABNEY) Brown, he was the cousin of and brother in law of Beverly A. Brown, he married Judith Mariah (BROWN) who was the sister of John Garland Brown, Mariah Brown was the daughter of Garland Brown the son of Benajah Brown and Martha “Patsy” (BRANSFORD) Brown and was the grandson of Benjamin and Sarah (THOMPSON) Brown of Albemarle, Louisa, Hanover and New Kent counties. The building was dismantled after the Civil War and the local residents got part of the building materials. I have several dozen of the triangular brick from the building. I own the property across the side road from the old Institute. The house was built for Susan Cobb, an instructor at the Institute and it is one of the buildings that is part of the area designated as a Virginia Historic Landmark. I have an original tin plate picture taken of the Institute Store that was operated by Oscar West and my great grandfather William Isaiah England. I have other very old pictures of the area if anyone is interested. I would be very interested in seeing any and all old pictures of the Institute and surrounding buildings. I’m also intrigued that the main building was dismantled. I can certainly understand need for materials after the war. Did the remains burn? Or is that not accurate? Many thanks, Ed, for your comments. If you’d like to discuss this further off the blog, please email me at jlyeck@gmail.com. Thanks Joanne for the information. Another question I had was about Samuel Jones, listed as one of the founders of the College. I believe it to be my Mary Win(g)field Jones grandfather. I have no information other than his name. Thanks for your help. It appears to me that the Benjamin Brown family that included Brightberry Brown of Albemarle/Buckingham Co., VA is represented by DNA “Group 8” at the Brown DNA Project (through Family Tree DNA). Any living male Brown who believes that he is out of that overall Brown family could take the Y DNA test to see if his Y DNA matches “Group 8.” By the way, Happy New Year to all! Dear Joanne: I just re-read your reply to my post in 2013. I had overlooked that your ancestor had contributed to one of John Chapman Blackwell’s obituaries. I have a couple of the newspaper clippings of these, but they did not clip the reference to the publication. Which one did he do, and do you have a copy? I have two clippings of obituaries for John Chapman Blackwell, one was co-written by my ancestor John T. L. Woodson. The other authors were W. B. Loving and John R. Agee. All were Freemasons in the Taylor Lodge, Buckingham County. I found these at the Virginia Historical Society, many years ago. They may have been in a vertical file for Dr. Blackwell. Looking at my photocopy, they were either pasted in a scrape book or, perhaps, a Bible. The publication sources are not identified. My Great Grandmother, Eliza Francis Claiborne Otley, and her sister, Laura Virginia Claiborne Reed, attended the Buckingham Female Collegiate Institute. Their father, John – sometime between the mid to late 1840’s and early 1850’s taught there and also held some administrative position. Thereafter he started and ran his own school for boys until 1859 when the family, including his wife Sara Ann Bransford and five daughters left for Nashville, TN. I suspect that he attended the Physic Spring Academy (?) run by Garland Brown as that gentleman was married to Martha Bransford a sister of Robert Bransford who was the father of Sara Ann Bransford. Following Robert’s divorce from Jane Hill and death (he had moved to Alabama) Sara Ann was taken in by the Garland Browns. I suspect that is where Sara Ann could have met John T. Claiborne. I’d appreciate any information on who Jane Hill’s parents were. I have just begun to research John T. Claiborne’s Academy and am planning a post or perhaps an article about schools and academies in Buckingham. I have the WPA survey for the Claiborne Academy and found it in operation on the 1850 census. So, John had left the Institute and gone on his own by 1850. Do you know the years the Claiborne sisters attended the Institute? I’m not familiar with Jane Hill; however, I descend from Martha Robertson Bransford who married John B. Agee in 1811. So, we are Bransford cousins. The 1850 Buckingham Co., VA census showed that one of the residents of this school was Mary Davidson, age 14, born in Virginia. There is a reasonable chance that she was a member of my overall Davidson family (some “branches” of which had been in Buckingham since its creation from Albemarle Co., VA in 1761). Bill, Thanks for pointing out that the girls at The Institute are enumerated on the 1850 census. In upcoming posts, I’ll be discussing some of the girls and their lives before and after their collegiate education. These students were not only from Buckingham County, but also from all over Virginia. All of these questions and more will be answered in future posts. The grand building burned, as did so many of Buckingham’s structures. There are some photographs but, to my knowledge, not of this building. More to come! What happened to this grand building? How long did it operate? Why that site? Any photographs?